After sitting through my classmates presentation, which covered the topic of creating a welcome page for a Facebook fan page, I became instantly interested in discovering the many ways in which this can be achieved. A few months ago I was presented with the task, or should I say challenge, of creating one for a hair company’s fan page, and later a music artists’ page as well. Lets just say that trying to learn to do these things from scratch is not easy, especially if you have the standards that I have for the aesthetics of projects that I work on. I often have to remind myself, that although I took basic design classes, I am nowhere near being a web developer or an HTML whiz. I did, however, manage to do the basics (which was find an image that I wanted to use, and lay some text over it) and it turned out well. But I also came across some fan pages such as that of Coca-Cola, celebrity hairstylist Ted Gibson, and a few others that look absolutely amazing (click the links to see how cool)… Of course they hired professionals to do the job, but the possibilities are limitless. You could basically create a mini website within your fan page! My question would then be, will this eventually eliminate the use of a personal website if you have one practically built into your Facebook wall? Afterall, welcome/landing pages are what get Facebook users to engage by convincing them to like the page for more exclusive content. Also, it’s probably more cost-effective than paying for a website host and domain. Any who, to keep things simple, yet not, check out this tutorial video on how to create a basic, but super cool welcome/landing page for Facebook. This entry was posted on November 3, 2011 at 8:47 pm and is filed under Randomness, Social Media, Uncategorized with tags celebrity hair stylist, coca cola, facebook, gatekeeper, HTML, landing page, ted gibson, tutorial, website, week11o, welcome page. You can follow any responses to this entry through the RSS 2.0 feed. You can leave a response, or trackback from your own site. I don’t think that Facebook pages will completely replace websites, at least not any time soon and at least not for major companies and brands. I think Facebook is on a mission to integrate every other aspect of the Internet into their site. And they will probably be successful. But I think there’s a certain degree of legitimacy and prestige to a website/domain versus a Facebook page that I personally hope major brands won’t be willing to sacrifice. I mean where would you rather get your information? Facebook.com/UMiami or Miami.edu ? 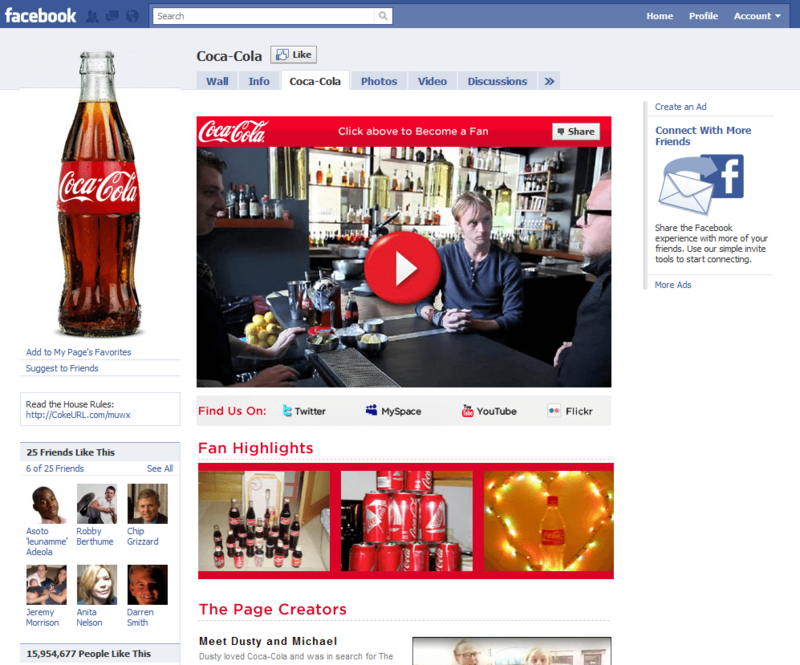 I would not be surprised if companies abandon traditional corporate websites in favor of Facebook fan pages. They are cheap and relatively easy to customize. The most appealing thing about fan pages, however, is that they exist where the consumers already are. The question is raised “where would you rather get your information?” I answer that question with another one. Where are you most likely to come across new information? Corporations have the option to promote ads, and the recent round of Facebook changes even recommends pages that relate to the content of user posts. Organizations have the power to stay relevant in their fans’ news feeds and they have the power to interact with their customers where they already exist. They have already adopted Twitter and Facebook. Why not consolidate their entire online repertoire into a place that has proven to be both successful and user friendly?